Acridine derivatives were first used as antibacterial and antiparasitic agents, later as antimalarial and anti-HIV drugs, and now as potentially anti-cancer agents due to their high cytotoxic activity. Due to their serious adverse effects, new synthetic derivatives were introduced and tested based on modified naturally occurring substances, such as acridone derivatives, which also exhibit potential anti-tumor activity. Most of them are DNA-damaging substances, causing relatively strong and selective destruction of tumor cells. 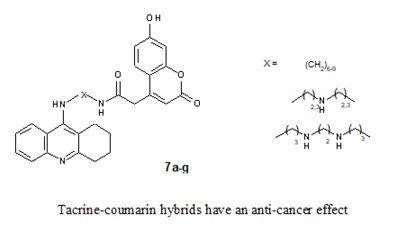 We have tested in vitro anti-proliferative effects of newly-synthesized tetrahydroacrid derivatives, namely tacrine-coumarin hybrid molecules, on various human and mouse cancer cell lines. Our results showed that tacrine-coumarin hybrids with seven, eight, and nine methylene groups in spacer reduce proliferation of cancer cells. A hybrid with nine methylene groups had the most significant anti-cancer effect.